It’s that time of year again… festival season! Summer has long been the host of music festivals all over the world, and it’s not hard to understand why. With beautiful weather, and (less) responsibilities, summer is the perfect time to let down your hair and enjoy the music. Whether you’re a festival veteran or a novice, this article is a handy guide to all the things you’ll need to make your upcoming festival the time of your life. Note: These are just for the music portion of the festivals, not camping essentials, which is another list entirely! Really, a water bottle is just a general life essential, but when it comes to festivals, it’s an absolute necessity. Some festivals don’t allow you to carry in your own water bottles, but most will (dehydration is not conducive to fun times!) So check out your upcoming festival’s website to make sure. Festivals are the perfect place to go with friends! Seriously, it’s at least three days of hanging out, listening to music and meeting new people. You’ll make a lot of memories, so it’s a great idea to surround yourself with awesome people who will make the experience even better. (Your cell phone will do!) You’re going to be there for the music, but that doesn’t mean you should leave the camera at home! Taking a few photos will help to preserve the memories forever. Some festivals won’t allow you to bring in aerosol containers, but good old liquid sunscreen is a must. Getting a harsh sunburn on your first day can seriously make the rest of the time miserable. So, lather up and thank yourself later. Or a hammock, if they’re allowed. Obviously the items allowed inside the festival area vary depending on which you’re attending, but you’ll be doing a lot of walking, and having the option to sit during or between shows will make the experience so much better. Wherever you’re going, it’ll probably be hot outside. Wet wipes are the perfect way to refresh yourself and get rid of the grease and grime from a long day of hanging out listening to amazing music and working up a sweat while dancing! Bonus: perfect to use in case the port-a-potties run out of hand sanitizer. Festivals are all about new experiences and enjoying your surroundings. It’s a time where you can forget about reality for a while, and just live in the moment. So let go of your worries and just have an amazing time! And of course, musical accompaniment. You’ll need a soundtrack both to prepare, and to reminisce about the awesomeness of your experience, and PlaylistHQ has you covered. You can make your own personalized playlist, or use one of the several pre-made festival playlists and enjoy whenever you want! This entry was posted in Uncategorized and tagged Music Festivals on June 26, 2014 by PlaylistHQ. Opening up with their hit “Everyday I Love You Less and Less” could have not been more ironic for the theme of the Kaiser Chiefs show on June 14th at the Randolph Taste of Chicago. Through the diverse dynamic of the crowd, including the man in his mid fifties doing a constant power point at the lead singer of the Kaiser Chiefs, Ricky Wilson, the entire night and the bass player Simon Rix’s stone cold face radiating the epitome of cool, the crowd at the Kaiser Chief’s Randolph Taste of Chicago set, myself included, seemed to love the Kaiser Chiefs more and more after their phenomenal set. From the mosh pit breaking out in the middle of the Kaiser Chief’s fourth song in their twelve song set, Ricky Wilson fed off of the energy of the crowd. Thus resulting in skinny jean clad Ricky Wilson defying the restrictiveness that is often associated with skinny jeans by going into a series of aberrant dance moves. As Ruby, their eighth song of their set finished, Ricky Wilson took out his ear piece and started a sing along to their hit single Ruby, that finished in Ricky Wilson’s cry of glee of “you do remember us do you”. It had been two years since the last time the Kaiser Chief’s preformed in Chicago, and Ricky Wilson was determined to make sure the crowd at the Randolph Taste of Chicago would always remember the Kaiser Chiefs. Defying the restrictiveness of skinny jeans once again, Ricky Wilson fed off the energy of the crowd through “Angry Mob”, the eleventh song of the set by jumping off of the stage and climbing on top of a truck that was located to the right of the stage. 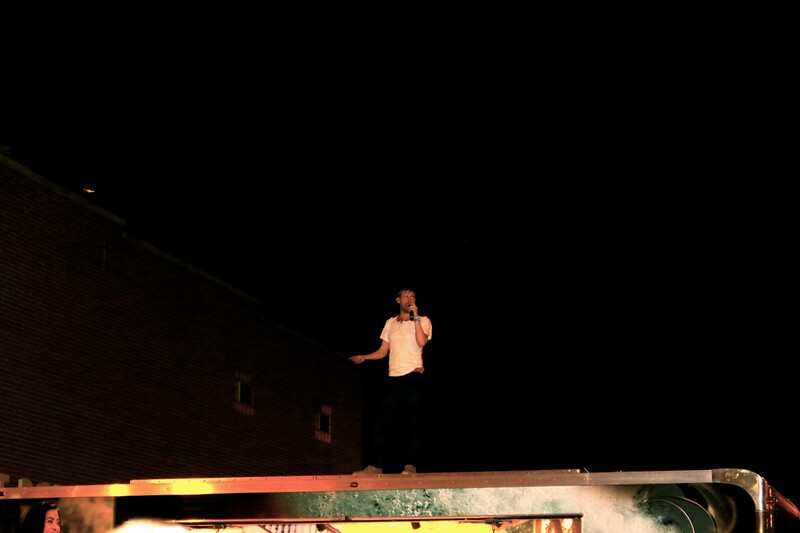 Singing part of Angry Mob on the roof of the truck, Ricky Wilson had difficulty getting down from being on top of the truck. Resulting in Ricky Wilson’s decision to jump into a display jacuzzi to the inside the truck and finished the rest of “Angry Mob” from lounging in the display jacuzzi. The British band closed with the song “Oh My God”. At the end of the set Ricky Wilson had one request, which was that everyone in the audience as well as the members of the Kaiser Chief’s “stay friends forever. Best friends forever”. As the Kaiser Chief’s ran off the stage, Ricky Wilson yelled to the audience “we love you best friends”, and by going off the crowd’s refusal to leave while chanting one more song, it is safe to say that the crowd at the Randolph Taste of Chicago reciprocates Ricky Wilson’s love after the Kaiser Chief’s dynamic show. This entry was posted in Concert Reviews and tagged Kaiser Chiefs, playlisthq, Taste of Randolph on June 25, 2014 by PlaylistHQ. Firefly Music Festival is right around the corner! It’s going to be four days of nonstop music, food, and fun, and I for one can’t wait. The lineup features tons of amazing artists, including Outkast, the Foo Fighters, and Imagine Dragons. The performances are staggered from June 19th to the 22nd, at various times, which is a relief because there are so many amazing acts, you’re going to want to see them all! Outkast: They’re reunited from a seven-year hiatus and doing a festival tour to celebrate their 20th anniversary, and from what I hear; they’ve still got it. Foo Fighters: Wicked cool dudes, Dave Grohl’s voice, songs that make you want to jump up and sing along; who could ask for more? Iron and Wine: Cannot wait to finally hear him perform live after listening to Our Endless Numbered Days an endless number of times. Hunter Hunted: Found these guys recently through their YouTube channel, and let’s just say I’m already hooked. City & Colour: This is going to be my second time seeing Dallas Green perform live, and I’m just as excited this time around. Imagine Dragons: I don’t know what else to say other than: YASSSSS! High stuck in their head? Just me? Okay. Third Eye Blind: Still so, so good. Childish Gambino: My friends are seething with jealousy over this one. “Childish Gambino is and has been changing the way we see hip hop.” ‘Nuff said. On top of awesome music, Firefly boasts a huge selection of high quality cuisine and a craft beer bar. There is also an arcade, a customized Toms store, and an on-site farmers market. Seriously, is there anything this festival doesn’t have? Features songs from every artist performing, to tide you over until June 19th! Who are you most excited to see at Firefly this year? This entry was posted in Upcoming Concerts and tagged Firefly Music Festival, Foo Fighters, playlisthq on June 6, 2014 by PlaylistHQ.